The Smithsonian Tropical Research Institute’s Bocas del Toro Research Station and Galeta Point Marine Laboratory are reporting an anomalous sea temperature rise and a major coral bleaching event in the western Caribbean. Although the U.S. National Oceanic and Atmospheric Administration, NOAA, issued an advisory in July announcing above-average sea surface temperatures in the wider Caribbean region, there had been no clear indication of increased sea temperatures in Panama and the western Caribbean until late August-early September. Scientists and local dive operators first noticed coral bleaching in the waters surrounding Isla Colon, in Panama’s Bocas del Toro province in July. Smithsonian staff scientist Nancy Knowlton and colleagues documented an extensive bleaching event in late September. 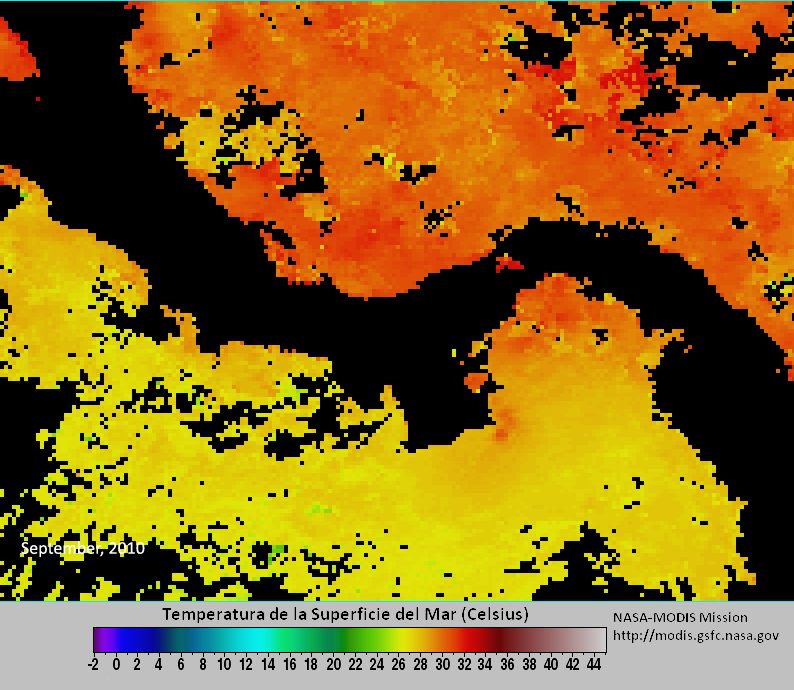 Station personnel recorded an extreme sea water temperature of 32 degrees C. Normal temperatures at this time of year are closer to 28 degrees C. This warming event currently affects the entire Caribbean coast of Panama from Kuna-Yala to Bocas del Toro and has also been reported at sites in Costa Rica. An extensive coral reef monitoring network in Panama, established over a decade ago by staff scientist Héctor M. Guzmán of STRI and partially funded by the Nature Conservancy, consists of 33 sites along both the Pacific and Atlantic coasts of the Isthmus, with 11 sites in the Bocas del Toro area. 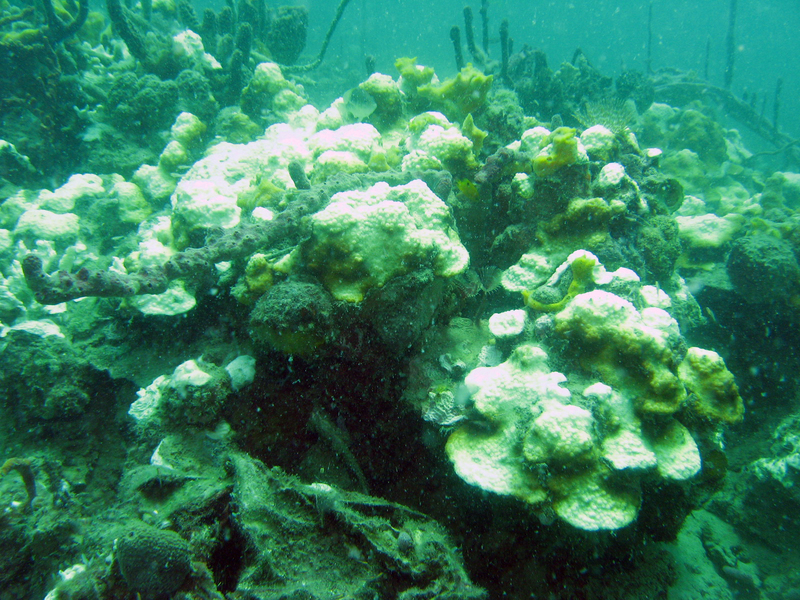 As of Oct. 3, 95 percent of the seafloor at the Bocas del Toro sites had been checked for bleaching. Coral mortality was limited to shallow areas near Isla Colon and a semi-lagoon area in Bocas del Toro, which is considered to be particularly vulnerable to bleaching as water circulation there is slow and temperatures tend to rise quickly. 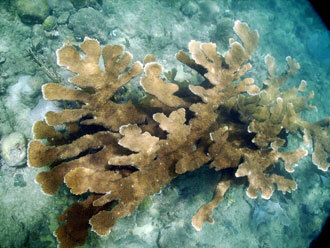 Researchers expect to have a complete report of the state of the coral reefs in several weeks. 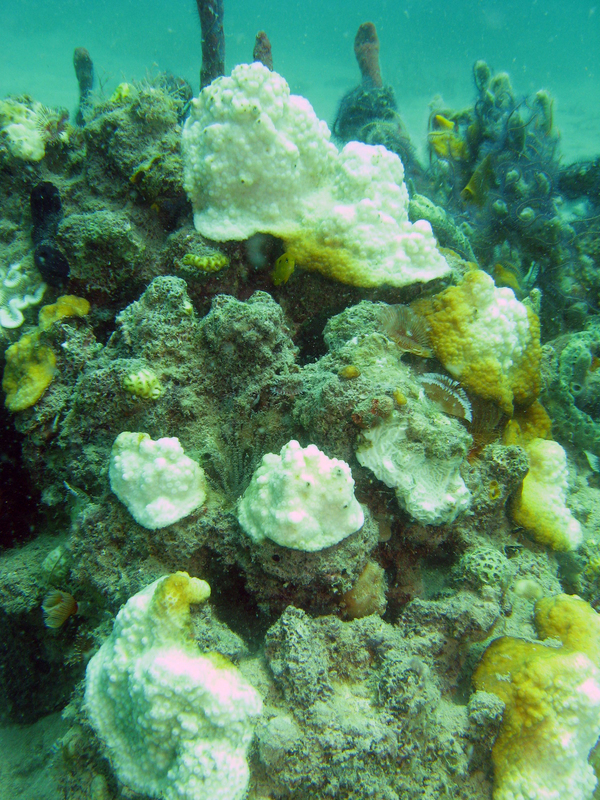 Coral polyps, the tiny organisms that make up a coral reef, contain photosynthetic algae called zoxanthellae. Coral bleaching occurs when corals lose their color as a result of the loss of their algal component, which is caused by increased water temperature or other stress factors. 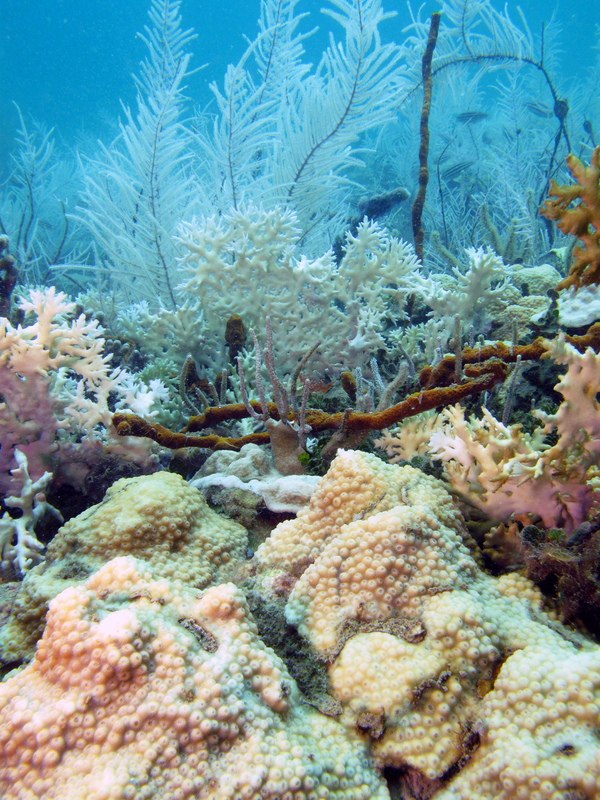 Bleaching impairs vital functions of the coral such as reproduction and growth. With prolonged warming, corals begin to die releasing great quantities of mucous resulting in increasingly turbid waters. Oxygen levels may fall as bacteria and fungi proliferate. Anoxic conditions affect fish and coastal productivity. STRI has monitored the water column to a depth of 20 meters at 23 sites. “Dissolved oxygen dropped to less than 3 milligrams per liter at 10 meters and nearly zero milligrams per liter at the bottom,” said STRI technician Plinio Gondola, who recorded the measurements. It is still not clear if temperature rise is directly related to bleaching and anoxia at this site. 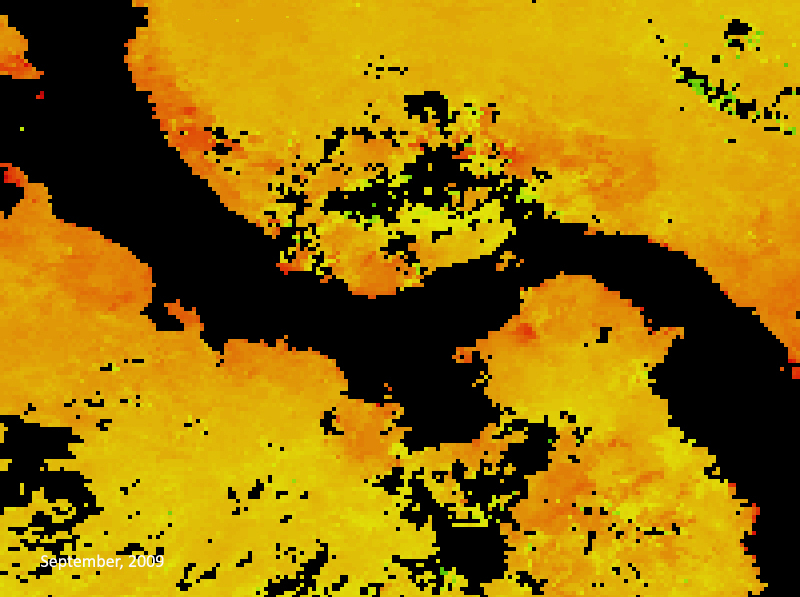 The images show ocean temperatures in September 2009 and in 2010. Increasing intensity of orange towards red indicates warming on a regional scale. The final outcome of this event is uncertain. 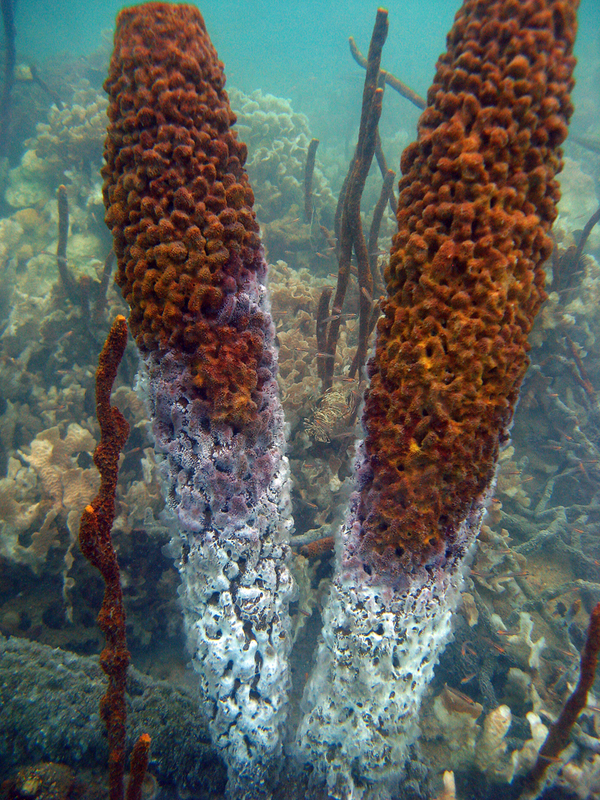 A similar event in 2005 in the wider Caribbean included intense bleaching in Panama. 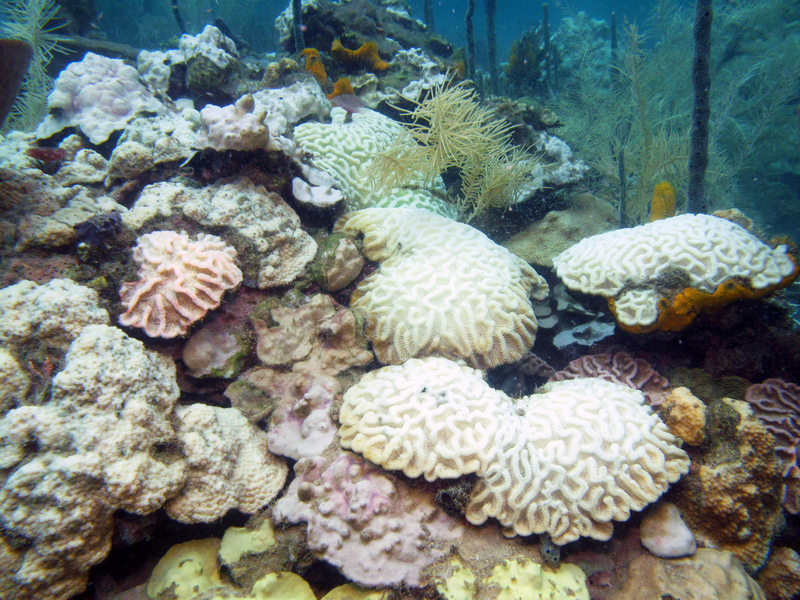 However, mortality was less that 12 percent in this zone and reefs have been relatively resilient. In Guzman’s opinion, hurricane season may be enhancing the current problem, resulting in low water circulation in the Southwestern Caribbean and thus creating a “warm pocket” of water along the coasts of Panama and Costa Rica. 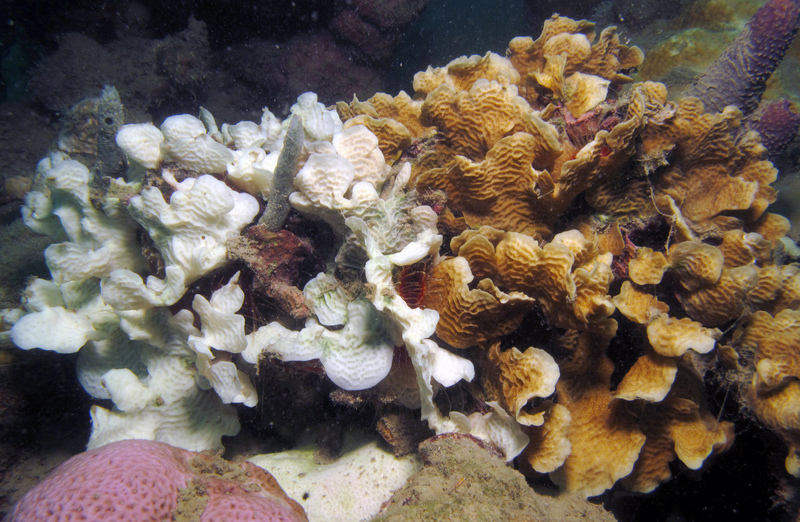 Abnormal sea temperatures not only affect corals, but also affect other reef organisms like these sponges.